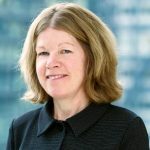 Lin O’Grady has more than 30 years of experience, working internationally in the infrastructure sector, both on public and private sector transactions. She is presently Deputy Director in the recently established Sustainable Infrastructure Group (SIG), with specific responsibility for the European Bank for Reconstruction and Development (EBRD) Green Cities programme. Prior to this, she has spent many years working on transactions in both the transport and municipal sectors. Lin started her career as an ODI (Overseas Development Institute) fellow in Southern Africa and went after this to work for the Department for International Development (DFID), then known as ODA. She then worked in the private sector, in transport consultancy in both South and East Africa, followed by the European Commissions’ TACIS (Technical Assistance to the Commonwealth of Independent States) programme. Latterly, at EBRD, she has been involved increasingly in climate finance and, as such, is one of the architects of European Bank for Reconstruction and Development’s Green Cities, where the Bank has committed funds in the amount of EUR 1 billion to tackle environmental challenges, through investments and policy reforms, in Cities across the Bank’s countries of operation. Lin has a BA in Economics and an MSc in Transport Planning and Engineering.